Pune/Kochi/New Delhi: The terror attacks in Mumbai last week are now taking their toll on one of India’s largest employers—the travel and tourism industry. Cutting across geographies, a spate of cancellations by foreign tourists is being reported by establishments as diverse as heritage hotels and houseboats. Even that redoubtable retreat of foreign tourists, Goa, has not been immune. “Tourists are moving out of Goa and the scene has slowed down considerably," said Shrikrishna Vernekar, the Goa office manager for Maharashtra Tourism Development Corporation, or MTDC. The timing of the terror attacks could not have been worse, affecting the peak season for an industry that contributes about 6.1%, or Rs2.86 trillion, to the country’s GDP, and provides 30 million jobs, or 6.4% of total employment, according to Tourism Satellite Accounting, a unit of the World Travel and Tourism Council. The ministry of tourism tried to reassure tourists that “all regions in India are safe and normal." In a 28 November note posted on its www.incredibleindia.com web page, the ministry said it had received inputs that tourists in Goa had no intention to fly back home, that there had been no cancellations on the Rajasthan luxury train Palace on Wheels and hotels were reporting regular business. 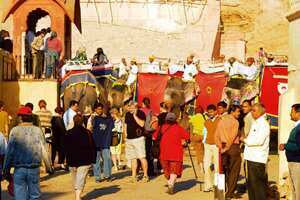 Tourism contributes $6 billion (Rs29,880 crore) in foreign exchange earnings, according to data from the ministry of tourism, and the first half of the year saw 2.72 million foreign tourist arrivals, up 11.1% over the same period last year. The terror attacks have worsened what was already a slow peak season on account of the global economic slowdown. Travel warnings about India issued by various countries to their nationals will also adversely hit the industry, said V. Venu, director of the Kerala Tourism Development Corporation. “Already, a 20% decline was expected this year owing to the global recession... From hotels to houseboat owners, there have been a few cancellations now. And it is too early to gauge or quantify the loss," said, E.M. Najeeb, president of the Kerala Travel Mart, or KTM, a private-public venture to promote tourism in the southern Indian state known for its backwaters and Ayurveda health spas. Najeeb, also managing director of the Great Indian Tour Company, estimates that the number of tourists could drop by as much as 30-40%. Tomy Pulikattil, managing director of the Pulikattil Tourism Group and member of the House Boat Owner’s Association Committee, says the past five days have seen cancellations for houseboat bookings. “In normal conditions at least 350 boats are in the waters, fetching around Rs35 lakh daily. But this time hardly 100-125 boats are operating ," he said. A group of 70 Japanese tourists who were booked for a tour of Maharashtra and Goa on The Deccan Odyssey, MTDC’s luxury train, called off the scheduled trip from Mumbai on 3 December. “It is too close to the events that occurred in Mumbai and they were concerned about the safety. They have assured us they will be back in January," said Vijay Chavan, the Odyssey’s general manager. While some hotel companies are reticent about talking about the expected cancellations, evidence is emerging that tourists are beginning to have second thoughts. In Jodhpur, Rajasthan, cancellations have hit the Umaid Bhawan Palace, a property owned by Taj Hotels, Resorts and Palaces, which also owns the Taj Palace and Tower in Mumbai that was targeted in last week’s terror attacks. “We have full occupancy during that period, but are beginning to get some cancellations and will take full stock of the situation in the next week. Cancellations will not be more than 10-15%, but we cannot put a finger to that number, because some guests might inform us in advance and some might just decide not to show up," said general manager Sanjay Umashankar. Luxury hotels in Jaipur, such as the Rambagh Palace and the Jai Mahal Palace—both Taj properties—are also expecting cancellations. “We will come to know in a day or two, and most of the cancellations will come from the leisure traveller," said Vilaas Humbre, general manager of the Jai Mahal Palace in Jaipur, where foreigners account for 85% of guests. At the Park Hyatt Goa Resort & Spa, a luxury resort in Goa, there were no rooms available when Mint enquired last week, and the hotel would not even entertain queries. Earlier this week, a reservations department executive said several rooms were available. Last week, 5-Star Alliance, an online travel agency that helps tourists track luxury hotels worldwide, said all luxury rooms in Goa were sold out for the peak season. However, The Leela Kempinski and InterContinental’s The Lalit Goa Resort now confirms room availability. Hotels, meanwhile, are trying to fill up rooms by cutting prices. According to a statement from TravelGuru.com, there has been a 15-20% reduction in average room rates for hotels in Goa, followed by 10-12 % cuts in Kerala and Jaipur. The Rambagh Palace in Jaipur, where a room goes for Rs28,000-40,000 a night, is preparing to offer discounts as high as 15-20%, should there be cancellations. However, the Umaid Bhawan Palace, where a room goes for Rs70,000-80,000 a night, has no plans for discounts. “We will not bring our prices down to balance occupancy, because safety is the prime issue," Umashanker said. KTDC’s Venu, however, sees a bright spot amid the gloom. Unlike a few years ago, when Kerala was dependent on major gateways such as Mumbai, three international airports—Kochi, Kozhikode and Thiruvananthapuram—now give 75% of foreign tourists direct access to the state, he said. The agency, he said, is hoping that the state’s focus on so-called wellness and rejuvenation tourism will set off losses from leisure tourism. A drop in foreign tourist arrivals will also free up room space for domestic tourists and this could make up for losses from cancellations by foreigners, Venu added. MTDC’s Chavan points out that despite the Japanese cancellations on the Odyssey, at least two groups from the UK, one of 80 and another of 24, have confirmed their plans. “Tourists react to the hype in the media but eventually they exercise their judgement on these issues." he said. P.R. Sanjai contributed to this story.